Probably Del Nero family, Florence, and, by descent, to Baron Cerbone Del Nero [1756-1816]; by inheritance to his widow, Ottavia Torrigiani [1758-1825], and her brother, Marquis Pietro Torrigiani [1773-1848], Palazzo Torrigiani (formerly Del Nero), Florence; by inheritance to his son, Marquis Luigi Torrigiani [1804-1869], Palazzo Torrigiani; by inheritance to one of his sons, probably Raffaele Torrigiani [1853-1927], Palazzo Torrigiani; acquired by (Charles Fairfax Murray, London and Florence) on joint account with (Thomas Agnew & Sons, Ltd., London); sold 1896 to Rodolphe Kann [1846-1905], Paris; (Duveen Brothers, Inc., London and New York) and (Nathan Wildenstein, Paris); sold 1907 to J. Pierpont Morgan [1837-1913], New York; by inheritance to his son, J. Pierpont Morgan, Jr. [1867-1943], New York; on consignment 1935 with (M. Knoedler & Co., New York and London); purchased February 1935 by Andrew W. Mellon, Pittsburgh and Washington, D.C.; deeded 1 May 1937 to The A.W. Mellon Educational and Charitable Trust, Pittsburgh; gift 1937 to NGA. According to evidence collected by the Duveen Brothers (see prospectus in NGA curatorial files and also the statement published in Duveen Pictures in Public Collections of America, New York, 1941: no. 55), the portrait was "said traditionally to be a member of the Del Nero family" and came from the collection of Baron Cerbone Del Nero. So far no supporting evidence has emerged to confirm this tradition, which was probably passed on to Duveen Brothers by the Torrigiani family; nonetheless, at least as far as the provenance is concerned, this appears plausible. In any case, the Galleria Torrigiani (see below), where the painting is recorded for the first time by the mid-nineteenth century (see Otto Mündler, "The Travel Diaries of Otto Mündler, 1855-1858," ed. Carol Togneri Dowd, in Walpole Society 51 : 132), was in the palace originally belonging to the Del Nero family. Old guides to Florence do not mention a Palazzo Torrigiani or family collections. Palazzo del Nero, instead, built around the middle of the sixteenth century on Baccio d'Agnolo's design, is listed as early as 1591 by Francesco Bocchi (Le bellezze della città di Firenze, ed. Giovanni Cinelli, Florence, 1677 [originally 1591]: 288-290, reprinted Bologna, 1973), who also records some valuable Renaissance paintings housed there. The palace also represented an important cultural point of reference, as it was the headquarters of the Accademia degli Alterati, founded in 1568. Along with the meetings of the Academy, the building housed an important collection of antiques and works of art, which in 1715 numbered some one hundred pieces (see Leonardo Ginori Lisci, I palazzi di Firenze, 2 vols., Florence, 1972: 2:675-682, and Liliano Gregori's unpublished 1993 Ph.D. dissertation for Università Cattolica, Milan, on the library of the Del Nero family). 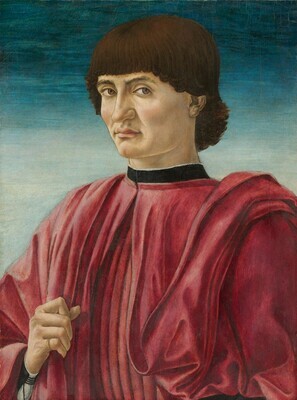 Carlo, born in 1433 and still living in 1477, was a champion of humanistic interests in the family and active in economic and political life; owing to his artistic sensibility he could possibly be the sitter in the portrait. The family died out at the beginning of the nineteenth century with Cerbone, baron of Porcigliano (see Agostino Ademollo, Marietta de' Ricci ovvero Firenze al tempo dell'assedio, 2nd ed. by Luigi Passerini, 6 vols., Florence, 1845: 4:1341-1344 n. 10). At his widow's death, their property passed to her brother, Pietro Torrigiani (see Luigi Passerini, Genealogia e storia della famiglia Guadagnia, Florence, 1873: pl. VII between pp. 148 and 149). In 1795 Pietro, the second child of Giambattista Guadagni, became the heir of his uncle, Cardinal Luigi Torrigiani, whose last name he assumed. See Passerini, Genealogia e storia, 1873: 153-158. The creator of the Gallery was probably Luigi Torrigiani, described as "un appassionato per le belle arti" who "arricchi di preziosi capolavori la pinacoteca della famiglia" ("an afficionado of the fine arts who enriched the family collection with precious masterpieces"; see Passerini, Genealogia e storia, 1873: 159), adding to the works already in Palazzo Del Nero those coming from his family and from its inheritances from the Santini and Minerbetti (see Ginori Lisci, Palazzi di Firenze, 1972: 679), as well as the Pazzi families (see Pompeo Litta, Familglie celebri italiane, 2nd ser., vol. 5 [n.d., but 1851]: "Pazzi," pl. X). Only in the late 1840s do Florentine guides begin to mention a Galleria Torrigiani, describing some of its artistic treasures (see Federico Fantozzi, Nuova guida ovvero descrizione storico-artistico-critica della città e dei contorni di Firenze, Florence, 1841: 600-601; Giuseppe François, Nuova guida della città di Firenze, Florence, 1850: 549). Otto Mündler visited the collection in September 1856 and described the painting: "Portrait of a man, by Pollajuolo (? ), It has a good deal of A. Verocchio and of L. di Credi. Backgroun, sky, very much injured." See "The Travel Diaries of Otto Mündler 1855-1858," ed. Carol Togneri Dowd, Walpole Society 51 (1985): 132, 310. Sir Charles Eastlake, director of London's National Gallery, also saw the painting in 1856, describing it as follows: "Portrait - man - hair close to brow - hand - lk red dress - sky in up. Part darkened - probably Verrocchio - suffered" (Susanna Avery-Quash, "The Travel Diaries of Sir Charles Eastlake," 2 vols., Walpole Society 73 : 1:311; kindly brought to the Gallery's attention by Alexander Röstel, curatorial fellow, National Gallery, London, e-mail of 12 February 2019, in NGA curatorial files). Only specific archival research could establish exactly how the contents of the gallery were divided among Luigi Torrigiani's four sons, Pietro, Filippo, Raffaele, and Carlo. According to information gathered by Duveen Brothers, however (see note 1), the painting belonged to Raffaele. According to the widow of Luigi Torrigiani, it was the decision of his four sons to break up the family gallery (see Elisa Torrigiani, Mon journal, Florence, 1905: 409-410). It seems that, as early as the 1860s, negotiations were begun with antique dealers and agents in the city for the sale of some of the works (see John Fleming, "Art Dealing in the Risorgimento," The Burlington Magazine 121 : 576). Nonetheless, only in 1896 were some paintings sold, including two cassone panels by Pesellino with stories from the life of David, now in the National Gallery in London (see Catalogue of Pictures forming the Collection of Lord and Lady Wantage, London, 1902: 113-119) and stories from the life of Esther by Filippino Lippi, purchased for the collection of the princes of Liechtenstein in the same year and in more recent times sold to the National Gallery of Canada in Ottawa; see Myron Laskin, Jr., and Michael Pantazzi, Catalogue of the National Gallery of Canada, Ottawa. European and American Painting, Sculpture and Decorative Arts, 2 vols., Ottawa, 1987: 1:167-169. Probably in the same year the NGA painting also changed hands; however, while the Ottawa panels were sold through Stefano Bardini, the NGA painting, according to the Getty Provenance Index, was acquired by Kann through Agnew's and Charles Fairfax Murray. The painting was Agnew's stock number 7624. See Wilhelm von Bode, Die Gemälde-Galerie des Herrn Rudolf Kann in Paris, Vienna, 1901: 27-28; Emile Michel, "La Galerie de M. Rodolphe Kahn[sic]-2," Gazette des Beaux-Arts 3e, 43 (1901): 496. See Edward Fowles, Memories of Duveen Brothers, London, 1976: 35-42. As can be seen from correspondence between Bernard Berenson and Isabella Stewart Gardner (and in particular a letter from Berenson dated 4 August 1907), J.P. Morgan purchased the entire Kann collection as a block, with the intention of keeping for himself only some thirty paintings. Mrs. Gardner, with Berenson's encouragement, tried to obtain the NGA painting for her collection, but was unsuccessful. Not officially announced, in the early months of 1935 news nonetheless began to spread of the sale of a certain number of paintings belonging to the Morgan collection (see "Morgan Sales," Art Digest 9 [February 1935]: 18; "Morgan Sale," Art Digest 9 [July 1935]: 22; Pantheon 15 [April 1935]: 116). Messrs. Knoedler & Co. were entrusted with the sale; the Getty Provenance Index provides the information that the painting was Knoedler's number CA 765 (see T.L.H., "Masterpieces from the Morgan Collection Sold," Apollo 21 : 167). It does not appear that Wildenstein & Co. was involved, as Shapley asserts (Fern Rusk Shapley, Catalogue of the Italian Paintings, 2 vols., Washington, D.C., 1979: 1:128). Loan Exhibition of Italian Primitives, F. Kleinberger Galleries, New York, 1917, no. 21, repro. Fiftieth Anniversary Exhibition, The Metropolitan Museum of Art, New York, 1920, unnumbered catalogue. Loan Exhibition of the Arts of the Italian Renaissance, The Metropolitan Museum of Art, New York, 1923, no. 1. Loan Exhibition of Important Early Italian Paintings in the Possession of Notable American Collectors, Duveen Brothers, New York, 1924, no. 32 (no. 8 in illustrated 1926 version of catalogue). Fifteenth Century Portraits, M. Knoedler & Co., New York, 1935, no. 5, repro. The Twentieth Anniversary Exhibition of the Cleveland Museum of Art. The Official Art Exhibit of the Great Lakes Exposition, 1936, no. 118. Berenson and the Connoisseurship of Italian Painting, National Gallery of Art, Washington, D.C., 1979, no. 110, repro. The Portrait in Renaissance Italy: From Masaccio to Bellini, Gemäldegalerie, Staatliche Museen zu Berlin; The Metropolitan Museum of Art, New York, 2011-2012, no. 21, repro. Bode, Wilhelm von. Gemälde-sammlung des Herrn Rudolf Kann in Paris. Vienna, 1900: xxvi-xxvii, pl. 76. Valentiner, Wilhelm R., ed. Unknown Masterpieces in Public and Private Collections. London, 1930: n.p., pl. 11. Jewell, Edward Alden. "Mellon's Gift." Magazine of Art 30, no. 2 (February 1937): 73, 79, repro. Duveen Brothers. Duveen Pictures in Public Collections of America. New York, 1941: no. 55, repro. Preliminary Catalogue of Paintings and Sculpture. National Gallery of Art, Washington, 1941: 157-158, no. 17, as by Antonio Pollaiuolo. Book of Illustrations. National Gallery of Art, Washington, 1942: 239, repro. 171, as by Antonio Pollaiuolo. Cairns, Huntington, and John Walker, eds. Masterpieces of Painting from the National Gallery of Art. New York, 1944: 36, color repro., as by Antonio Pollaiuolo. Paintings and Sculpture from the Mellon Collection. National Gallery of Art, Washington, 1949 (reprinted 1953 and 1958): 21, repro., as by Antonion Pollaiuolo. Einstein, Lewis. Looking at Italian Pictures in the National Gallery of Art. Washington, 1951: 44-47, repro., as by Antonio Pollaiulo. Walker, John. National Gallery of Art, Washington. New York, 1956: 18, repro., as by Pollaiuolo. Summary Catalogue of European Paintings and Sculpture. National Gallery of Art, Washington, 1965: 24. Cairns, Huntington, and John Walker, eds. A Pageant of Painting from the National Gallery of Art. 2 vols. New York, 1966: 1:38, color repro. European Paintings and Sculpture, Illustrations. National Gallery of Art, Washington, 1968: 17, repro. Shapley, Fern Rusk. Catalogue of the Italian Paintings. 2 vols. Washington, 1979: 1:127-129, 2:pl. 88. Watson, Ross. The National Gallery of Art, Washington. New York, 1979: 22, pl. 5. Walker, John. National Gallery of Art, Washington. Rev. ed. New York, 1984: 76, no. 24, color repro. European Paintings: An Illustrated Catalogue. National Gallery of Art, Washington, 1985: 77, repro. Mündler, Otto. "The Travel Diaries of Otto Mündler." Ed. Carol Togneri Dowd. Walpole Society 51 (1985): 132, 310. Boskovits, Miklós, David Alan Brown, et al. Italian Paintings of the Fifteenth Century. The Systematic Catalogue of the National Gallery of Art. Washington, 2003: 588-595, color repro., as Attributed to Piero del Pollaiuolo. Hand, John Oliver. National Gallery of Art: Master Paintings from the Collection. Washington and New York, 2004: 18, no 11, color repro. Schumacher, Andreas, et al. Botticelli: Likeness, Myth, Devotion. Exh. cat. Städel Museum, Frankfurt am Main, 2009: 27, fig. 13, as by Piero del Pollaiolo (?). Johnson, Ken. “Getting Personal.” New York Times 161, no. 55,628 (December 23, 2011): C27, C30, color repro. Butterfield, Andrew. "They Clamor for Our Attention." (Review of The Renaissance Portrait from Donatello to Bellini, Berlin and New York, 2011-2012.) The New York Review of Books 59, no. 4 (March 8, 2012): 10, color repro. Tonkovich, Jennifer. “Discovering the Renaissance: Pierpont Morgan’s Shift to Collecting Italian Old Masters.” In A Market for Merchant Princes: Collecting Italian Renaissance Paintings in America ed. Inge Reist. (The Frick Collection Studies in the History of Art Collecting in America, 2) University Park, Pennsylvania, 2015: 43. Madersbach, Lukas. "'fatto alla spera'? Das Porträt des Leon Battista Alberti aus den Orti Oricellari." Mitteilungen des Kunsthistorischen Institutes in Florenz 58, no. 3 (2016, published February 2017): 319-347, esp. 337 fig. 16.